Firefox 4 (stable) will be released soon and I though I'd let you know how to install it in Ubuntu 10.10 Maverick or 10.04 Lucid from a PPA - the proper way (from the semi-official Firefox 4 PPA). No, using Ubuntuzilla or the Mozilla Daily PPA (well, this PPA is relatively ok but you'll never get stable builds so you might start receiving Firefox 4.1 alpha updates - or whatever the next Firefox version will be called -, as soon as Firefox 4 is released) is not the proper way to install Firefox 4. Why? Ubuntuzilla: the Ubuntu devs had to push some fixes to the official Firefox builds just so they don't get so many bug reports that come from those using Ubuntuzilla. Check out this changelog (via Guiodic). Ubuntu Mozilla Daily PPA: sure, if you like bleeding edge software, this PPA is ok but this PPA will never provide stable builds so one day, Firefox might stop working or corrupt your profile. Further more, this PPA will also upgrade Thunderbird to the latest daily builds. So if you want Firefox stable, go with the solutions below! Before continuing, please note that I've only tested Firefox 4 from the PPA below in Ubuntu 10.10 Maverick Meerkat and while there shouldn't be any issues in Ubuntu 10.04, use it at your own risk. The Firefox 4 PPA (stable) below is semi-official but it doesn't include all the packages available in the Ubuntu repositories (so for example, you'll have to manually install a language pack if you want Firefox in your language - see below). 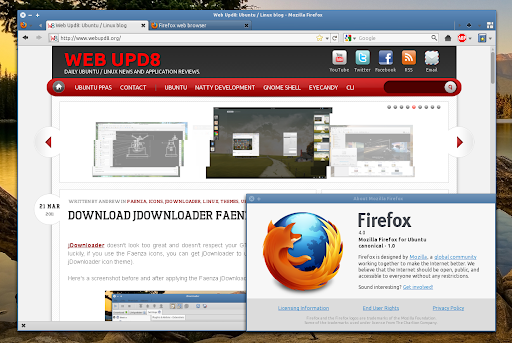 Update: The Firefox PPA (stable) has been updated and it now provides the latest Firefox 4 for Ubuntu 10.04 Lucid Lynx and 10.10 Maverick Meerkat. It doesn't matter if you're upgrading to Firefox 4 or you're installing it for the first time, you can use "sudo apt-get install firefox" (I've used this command because those who've previously installed Firefox 4 from the Mozilla Daily PPA or some other unstable PPA might have a build called "firefox-4.0" installed - that won't be upgraded). Ubufox is a Firefox extension that ships ubuntu tweaks and extensions that ships with Ubuntu (and is available in this PPA). Also, in the future when you'll want to install a new Firefox milestone (alpha, beta or RC), use the Firefox Next PPA. Some users have reported that using the Firefox 4 PPA in this post will install Firefox in English only. To fix this you can install an extension from here: 32bit | 64bit (make sure you install the correct extension for your language!). I've tested this in Ubuntu 10.10 and it seems to work proprely. 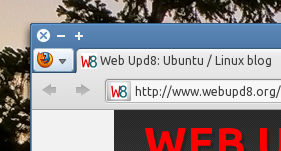 When upgrading to Firefox 4, if you use the old Firefox profile your menu might be displayed on the right. You can move the menu to the left and also, get a Firefox icon instead of the menu by using the Movable Firefox Button extension (thanks to SckyzO for the tip!). This post was updated March 22, as soon as Firefox 4 was uploaded to the Firefox Stable PPA which I suggest all blogs to do because most of the "how to install Firefox 4 in Ubuntu" posts you'll find on the web include instructions to use the Mozilla Daily PPA which doesn't and will never include Firefox 4 stable.